Returning with his newest release, Between the Bars, Matt York beckons listeners to pull up a bar stool for some drunken wisdom. Filled with the country spirit, the rhythms burst with driving guitars, saloon-esque pianos, and a brooding horn section. These songs convey the heartache of life and relationships gone wrong. “Honkytonk Hangover” waltzes you through the doors of a 1950’s Bakersfield saloon. This old school country ballad surges with powerful energy, exploring the despair that even though life is full of regrets, it’s too late to turn back. York reflects this with, “Introduced my sadness to a beer/No one likes me here at the honkytonk/but I don’t feel alone when I’m here.” With a lively organ solo, a feathery piano waltz, and an infectious upbeat tempo, the track challenges our perceptions of resilience while employing self-loathing. Next is “When the War Began,” an emotive break up song that centers around a toxic romance. For anyone that has had to face rejection, the lyric, “Yeah, there’s never a nice way to say you’re not the one,” is uncomfortably relatable. York’s vocals may be carefree, but his lyrics bring a sense of pain that’s all too real. The contemplative guitar and intensity of the organ in the latter half support the melody's bluesy edge. Matthew Girard’s beautiful yet mournful trumpet solo stands out in “September’s Coming Soon,” where York’s vocals soar over the nimble Spanish guitar. “Man Who Does Nothing” is a wistful rumination from a man that just can’t get his life together. The acoustic guitar elevates its appeal. “Calling for You” closes out the album with ethereal vocals that reveal a storm of emotion. Matt York demonstrates with this album a real knack for guitar playing and a suburb use of words as a songwriter. Between the Bars explores with lush instrumentation the inner madness of a resilient soul. The character may not have things figured out but he's still trying somehow. Between the Bars will be available on November 3rd. You can purchase the album on Matt York's Bandcamp page. Matt York will perform a special album release show on November 3rd at the Atwoods Tavern in Cambridge, MA. Yarn played NYC's American Beauty last night. Check out our review HERE. Yarn is an Americana band from Brooklyn, New York. The band formed in Brooklyn back in the mid 2000's and started playing shows in New York City every Monday night at Kenny's Castaways and every Wednesday night at Hill Country BBQ. 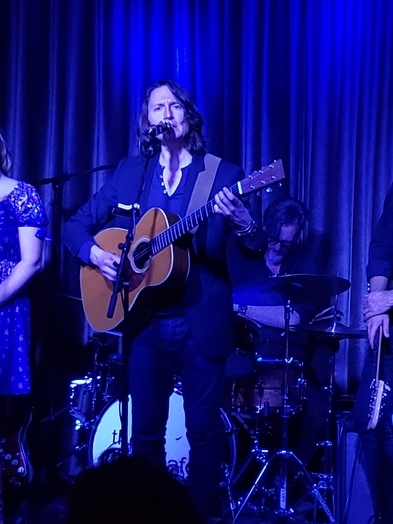 Yarn consists of Blake Christiana (Acoustic Guitar and Lead Vocals), Rod Hohl (Electric Guitar and Backing Vocals), Trevor MacArthur (Acoustic Guitar and Backing Vocals), Rick Bugel (Upright Bass), and Bobby Bonhomme (Drums). Yarn shows are a bit different from the norm. The band feeds off the energy of the crowd and plays whatever they feel like playing. They don't use a setlist. It's crazy but makes for a unique one of a kind experience. Some songs clock in at three minutes and others clock in at 20 minutes. It could be a sing along, classic country, or even disco. Yarn mixes a lot of different musical styles to create their signature sound. They don't follow any trends or write top 40 hits. They just do their own thing. They sound like they came out in 1972 rather then 2017. The band follows the Grateful Dead with epically long jam sessions. The best way to describe it is to go out to their shows and experience it for yourself.